With July 2005 over and done with at the box office (and let us never speak of it again), we move into the last month of summer. An unlikely savior of the box office at the start of the season, the weekend's sole opener, The Dukes of Hazzard might be just what's needed for a boost. As potential bad ideas go, a live-action Dukes of Hazzard movie has to rank pretty high up there. The degree of difficulty in translating TV shows to the big screen is high, and the floor for badness seems to be unlimited (though I think no one will be able to throw under Car 54, Where Are You?). The Dukes of Hazzard was a show not usually known for its sophistication and cinematic qualities, but was known for car crashes and very high cutoff jeans. Then again, considering some of the high-profile, high-concept bombs this year, there might be no better material for adaptation right now. Starring as the good ol' boys never meanin' no harm are Seann William Scott and Johnny Knoxville as Bo and Luke Duke, respectively, with Jessica Simpson filling the Daisy Duke shorts. 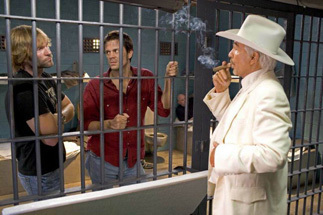 A bit of stunt casting rounds out the crew, with Willie Nelson as Uncle Jesse and Burt Reynolds as the villainous and scheming Boss Hogg (he's all wrong for the part in my opinion, but we'll see about that). Plot? Well, it's all about saving the Duke farm, which usually necessitates jumping the General Lee (the real star of the film) over something at ridiculous speeds. On this point, director Jay Chandrasekhar (of Super Troopers fame) seems to have gotten it just right, with a plethora of car chases and wrecked police cruisers. That spot in the trailer where the car is launched onto the freeway never fails to bring out goosebumps, I have to say. Reportedly, forty Dodge Chargers were used in the film, and seven are still drivable. That certainly says something about the film. It also says something about how the target audience may react to the movie, an important consideration considering that there will likely be strong resistance to it from people that don't like ‘dumb' cinema. The presence of Stifler and Jackass in the leads does cause concern (the Dukes pulled off some pretty clever schemes in the series, after all), but people like a little bit of comedy in their action of late, like peanut butter in their chocolate. Opening at a massive 3,785 venues, Dukes of Hazzard should easily walk away with the weekend with around $32 million. Taking advantage of two straight weeks of anemic openers, The Wedding Crashers captured first spot last weekend after twice finishing second. It's the first film in about two years to show old school legs, and has dropped less than 25% in two straight weekends, bringing its total to $124 million as of Wednesday. With this kind of run, even second place in the summer might not be out of reach, and at the very least should approach the $200 million mark. New Line has captured lightning in a bottle by finding an underserved market and should be applauded for finding one of the bright spots in the summer. Charlie and the Chocolate Factory continues to plummet, although not at the same incredible 50% level as seen in its second weekend. It's doubtful that it can reach the $200 million mark, but it should at least wave and say hi to it. It's a slightly disappointing result after such a large opening, but Johnny Depp at the least must be pleased. Sky High was the best of last week's new films, opening to just over $14 million, and has an excellent chance to show some legs of its own. The family friendly superhero pic was not heavily promoted and had few names, but was very enthusiastically received. It should do very well even by children's film standards, and hold above $10 million. Next to this is another little film that could, Must Love Dogs, which opened to just under $13 million. Although few people have anything that bad to say about the Diane Lane/John Cusack romantic comedy, not that many have too much good to say about it either, leaving it likely to flounder a bit in the coming weeks. Give it about $7.5 million this weekend, and a respectable $50 million box office total.